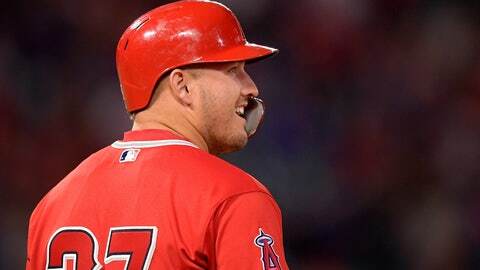 ANAHEIM, Calif. (AP) — Kole Calhoun is ready for the season to start, as he showed on offense and defense in the second game of the Freeway Series. Calhoun hit a home run and a double, but the Los Angeles Dodgers scored five times in the seventh inning of an 8-7 victory over the Los Angeles Angels in their exhibition matchup Monday night. The right fielder also threw out Joc Pederson trying for a double and said he is right where he wants to be with his preparation. Calhoun homered on the first pitch from Dodgers starter Kenta Maeda. The Angels went up 3-2 in the third inning when Mike Trout hit a bloop single to score Calhoun after his stand-up double. Calhoun has been attempting to use more of the field to get the most out of his bat. His second home run of the spring went over the wall in left-center, and his double was well struck to right. That approach could help boost Calhoun’s production. Despite hitting 19 home runs for the second straight season last year, his batting average dropped to .208 with 18 doubles — his lowest output in both categories since becoming a regular in 2014. Maeda said through a translator he was “50 percent happy” with his final tuneup after giving up three runs and five hits in three innings. The outing was as much about getting into the repetition that comes with the regular season as it was about being at his best, he explained. “It’s my first time pitching at a 7 p.m. game, so getting my routine back in, figuring out what to do when was one of my (goals),” Maeda said. Noe Ramirez started for the Angels, who used their bullpen to get through the game. Ramirez threw a hitless inning. The Dodgers were able to get their third win in the past 20 preseason games at Angel Stadium thanks to a scoring outburst in the seventh. Jeter Downs, Cody Bellinger and Matt Beaty all drew bases-loaded walks, and Connor Wong hit a two-run single. Jared Walsh had a bases-loaded triple in the ninth to shave the Angels’ deficit to 8-7, but Parker Curry struck out Matt Thaiss and got Tommy La Stella on a grounder to end the game. NOTES: Dodgers LHP Clayton Kershaw (shoulder) threw two innings under simulated game conditions. Los Angeles manager Dave Roberts said he was “very encouraged” by how Kershaw looked, but the next step in his progression won’t be determined until after he throws a bullpen and four-inning simulated game during the upcoming week. … Dodgers RHP Walker Buehler will start against Arizona on Sunday after throwing 60 pitches during a four-inning simulated start Monday. … Angels LF Justin Upton will undergo an MRI on his sprained left big toe. Manager Brad Ausmus said Upton was feeling sore after sustaining the injury Sunday and did not know if he would be available for the season opener Thursday at Oakland. … Angels LHP Andrew Heaney (elbow) threw 20 pitches off the mound. Ausmus said Heaney will throw off a mound again Wednesday, barring any setbacks. The Freeway Series concludes Tuesday with the Dodgers putting LHP Julio Urias up against RHP Jaime Barria for the Angels.